Thirty Minor Upanishads is a collection of translation of small Upanishads which are part of Vedas and are not counted among the popular Upanishad texts. 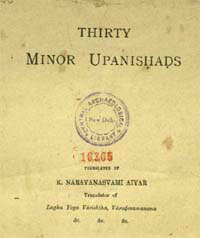 The Upanishads are translated by K. Narayanaswami Aiyar and was published in 1914. Now you can download the book in pdf format for free from the Central Archeological Library of India. To read online or to download and save you will need to have a pdf reader installed in your browser.